Melamchi Water Supply Project (MWSP) was designed to finance four major components (i) Infrastructure Development, (ii) Social and Environmental Support; (iii) institutional reforms; and (iv) Project implementation Support. The MWSP was projected to cost US$ 464 million in 2000 prices. According to the original financial plan, ADB shouldered the largest financing share (US$120 million equivalent) followed by the World Bank (US$80 million), the Japan Bank for International Cooperation (JBIC), US$52 million equivalent), NORAD (US$28 million equivalent), Sida (US$ 25 million equivalent), the Japan International Cooperation Agency (JICA, $18 million equivalent), the Organization of Petroleum Exporting Countries Fund for International Development (OFID/OPEC), $14 million equivalent), and NDF ($9 million equivalent). The Government’s original financing share in the MWSP was $ 118 million equivalent. World Bank proposed a PSP financing plan (Private Sector Participation) financing plan for institutional reform components of the project. But this private lease failed to attract interest from potential bidders in both tendering efforts and hence the World Bank decided to drop proposed funding in June 2002. Due this, other funding partners has also lost their interest and hence delayed the project operation until new scheme of financing re-designed and sourced. After a demonstrated commitment and initiatives taken by the government, ADB agreed to recover the financial lag created and re-structure the project as Melamchi Valley Subproject (Subproject1) and Kathmandu Valley Subproject (Subproject2). Currently, the MWSDB governs only the Subproject1 activities. Nepal government has been continuously putting effort to complete the Melamchi Water Supply Project and provide safe drinking water to the people of capital city, Kathmandu since November 1998 after the establishment of the Melamchi Water Supply Development Board (MWSDB). Various researches, studies and concept has been put forward before the formal establishment of MWSDB, it seems that country has already estimated the future crisis of water in the capital city and started programming of Melamchi project since 1990. 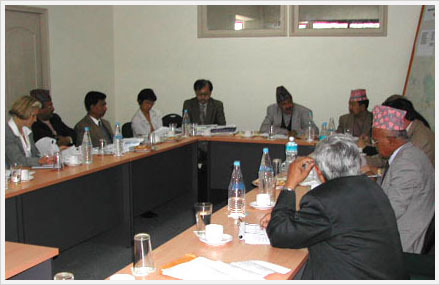 Although, Nepal government has allocated only the 28.56 percent of total estimated budget to be spent to complete the Melamchi Water Supply Project, it has already worked hard to create/collect the required fund coordinating with different international/multinational and bilateral financial institutions. Keeping the evaluations and follow up of all sorts of project works, the government of Nepal has allocated budget in the following work areas of the project. Infrastructure Development – 36.98 million Out of 148.64 million, i.e. 25 percent of total cost of this component. Also, the government of Nepal bears 100 percent expenses on estimated 16.67 million US$ tax and 19 percent (2.97 million US$) of contingencies estimated for physical and prices contingencies our of 16.02 million US$. Hence, in total the government of Nepal bears a sum of 73.16 million US$ out of 235.31 million US$ estimated to invest in the project construction i.e. approximately 31.02 Percent of cost allocated for Subproject I of Melamchi Water Supply project. ADB is the major donor for the Melamchi Water Supply Project. A total of 91.72 million US$ out of estimated 235.31 has been financed as a Loan. This amount will be approximately 39 percent of the total cost estimated to complete the task as assigned to Subproject 1 of Melamchi Water Supply Project. Infrastructure Development – 60.49 million Out of 148.64 million, i.e. 41 percent of total cost of this component. Social and Environmental Support – 6.64 million out of 8.31 million investment in this sector (80 percent of total cost of this component. A sum of 9.08 m US$ out of 16.02 m US$ has also been estimated to finance for physical and price contingencies from the Loan of ADB. (iii) construction operation and maintenance of Camp site offices Pulbazar and different Adit Access points. The loan agreed to provide by the Japan Bank for International Cooperation (JBIC) has now been invested in the Melamchi Water Supply project through JICA. A sum of estimated 46.28 million US$ out of 235.31 million US$ i.e. 20 percent of total cost incurred in the subproject1 of Melamchi Water Supply Project. Basically, out of the total Loan amount i.e 46.28 million, 37.47 million US$ will be invested in order to construct the water treatment plant at main outlet of the 26.3 Km long tunnel at Sundarijal. Rest of the loan amount (8.81 m US$) will be spent on different training required to operate the water treatment plant after completion. Also, this loan will contribute for physical and price contingencies. Nordic Development Fund has also contributed to an integral part of project cost. The fund from NDF has been spent in consulting/expert services of Design and Supervision of 26.3 Km long tunnel. Total amount i.e. 10.45 million US$ will be 4 % of total cost subproject 1 which occupies around 66 percent of total Design and Supervision cost of the project.